During the 1980’s and early 1990’s Jack belonged to an organisation called The National Poetry Foundation but I can find no evidence that this organisation still exists. The Foundation was a registered charity with Lord Ted Willis and Spike Milligan as patrons and operated from Fareham in Hampshire, UK. Members could submit work to the Foundation for criticism and when sufficient work of an acceptable standard was produced the Foundation would publish a collection of poems for that member. Work was also published in their bi-annual publication “Pause”. Jack never bothered to date his poems so the dates that I have been able to assign to them have come from the critique sheets that he received from this organisation. Several of his poems were accepted for a future anthology and at least one that I know of was published in “Pause”. The first of these will be the subject of my next post. Another Cheshire poet, Dora Kennedy, had a collection called “The Sheltering Coast” published by The National Poetry Foundation in 1992, but no collection of Jack’s poems was ever produced. He had probably not written enough poems by the time his membership lapsed, and this seems to be also when he ceased writing as far as I can tell. I wonder if this coincided with the demise of the Foundation? If any reader has any more information on The National Poetry Foundation I would be very pleased to hear. In my previous post “An Early Picture” (Nov, 17th) I stated that I had no family photographs which included Jack’s eldest sister Annie. 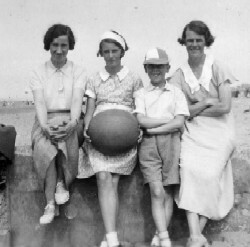 Then I came across this photograph which is of Jack with his mother on his left, his sister Ena on his right and I think it may be Annie on her right but I am not sure. If any family member could confirm this for me I would be very grateful. This undated poem is one of my favourite poems that Jack wrote – so much so that I submitted it posthumously to “Countryside Tales” magazine. This magazine is one of several produced by Park Publications and comes out four times a year. They can be found at www.parkpublications.co.uk. The poem was published in the Winter 2008 issue. Glares sulkily at the felonious flames. Has been replaced by solid and assured. Lies gently musing in the vibrant bliss. His brier is primed then pampered into life. To add an extra whisper on the wind. Deep pleasure in the warmness of it all. The picture drawn, the pen is cast away. I apologise for the quality of this photo. It is not very good as it is scanned in from a copy of an old original. 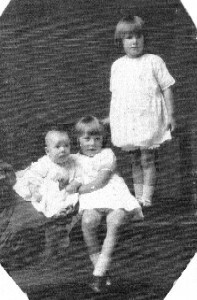 It is a picture of Jack as a baby with his sisters Lucy (seated) and Ena (standing). His eldest sister, Annie, is not present here or on any photos I have of Jack as a child. At the time this photo was taken she would have been about 16 years old and was probably at work. This is the second of the two poems published in the “Poetry Kingdom” anthology in 1972. There was no copy of this poem found among Jack’s papers, nor did he seem to have a copy of the anthology on his bookshelf. Jack moved home several times and it is sadly possible that many of his poems were thrown out or lost during the moves. Fortunately I still have a copy of the book which Jack gave me when it was published and it is from there that I have copied the poem. But no-one saw him there. Fall down by the way. Trying to head the race. The weak get left behind. They did not give a damn. He had failed to propagate. Having worked out how to set my Welcome page as a static front page I did so a few hours ago – only to change my mind again and revert to the original layout. I think I will leave the Blog Posts as the front page after all! What do you think? Please do read the Welcome page anyway if you have not already done so as it explains the aims for this site. The following poem is one of two that were published in an Anthology called “Poetry Kingdom” in 1972. This is the earliest date I have for any of Jack’s poems. The version of this poem that was found amongst Jack’s papers after his death was incomplete. What follows is the version that appeared in the Anthology. I saw a spider on the floor. For I have my part to play, like you. Just as much as any man. So leave me be to see it through. With your so called brain and talent. While you are crowding out the earth. Why don’t you live by Nature’s code. The strong must live, the weak must go. No-one gets a helpful hand. I smashed it flat with a single blow. I can’t stand alone, can you? Although the road ahead is black. Oh. whatever shall we do? I don’t know and nor do you.